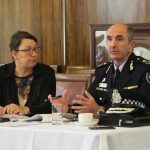 The Annual Civil Society Dialogue on Women, Peace and Security was established in response to the release of the Australian National Action Plan on Women, Peace and Security 2012-2018. While the event supports shadow reporting on the implementation of this whole-of-government policy, it is important we remember that people, not policy is at the heart of the Women, Peace and Security agenda. For this reason, in 2015, the Dialogue included two country specific sessions. Each country specific panel consist of one panelist from the Australian Government, one from an Australian civil-society organisation, and one conflict affected woman. Ethel Sigimanu, Permanent Secretary of the Department of Solomon Islands’ Ministry of Women, Youth, Children and Family Affairs was invited to join the panel. Unfortunately, she was unable to attend on the day. 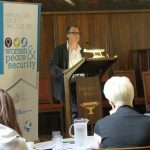 What is men’s leadership for Women, Peace and Security?